Is Shedworking The Solution To Working At Home? Shedworking as a term is probably new to most people. It’s a rather recent turn of phrase even though people have been working from buildings in their gardens for centuries. The famous names which have attracted the most attention are artists and writers – Roald Dahl, Thoreau, George Bernard Shaw. But nowadays you’re just as likely to find accountants at the bottom of the garden as you are sculptors because, especially in the UK, garden offices are becoming big business. Increasing numbers of people are working from home for many reasons – better technology, increased awareness of the advantages of flexible working patterns, the eco-friendliness of cutting out a commute – and many of them are choosing not to work from the spare bedroom but to shedwork. Commuting to the end of your garden adds various extra dimensions to your homeworking experience. Psychologically, shedworking marks a clear difference between where you live and where you work – there’s no taint of work attached to any part of your home. Instead all the taint is in the shed. Moreover, if you’re interested in green issues, you can add a green roof to your garden office, build yourself a living wall, work in a treehouse, or indeed run the whole thing via solar panels. And when you want to throw your coffee grounds away, the garden is only a short recycling step away. Physically, it’s easier to prevent – or at least restrict – your children, spouses and pets invading your work space if you’re based in a garden office (although admittedly I get more bees in here than I did when I worked in the dining room). Nor is there any need to double up on spaces. With a shed, your third bedroom remains modem free and your dining room table is not deluged by paper. 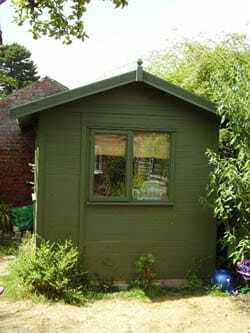 And just as importantly, a shed keeps you away from the fridge so the temptation to nibble is more remote. Financially, it adds value to your property, up to 5% according to some reports, and is certainly much cheaper than moving house to get an extra room in which to work. It’s also a great place to meet clients: I’ve had several meetings in my garden office and every single visitor has been at the very least intrigued by the arrangements and at the best positively impressed.